So you have decided to get an air compression system for your garage and would like to check the best ones in the market? You have come to the right place. Not only have we researched the quietest, best stationary air compressor system and the best portable air compressor system on the market, we have also researched about the line system design which you will need and which are the best pipes you will need for setting up your air compression system in your garage. If you do a lot of work in your garage, you will need a line system rather than just a compressor which sits below a hose reel that you see in a normal auto repair shop. What is the type of work that you do in your garage? Will you use the equipment alone or do others use it too? Will it make your garage more efficient and how do you ensure that it is safe? Have you secured baseline readings on the load profile of the air system before you set it up? Which compressor should you go for? – What will you use the compressor for?, Wow many will use it at once?, What should be the compressor capacity?, What is the power supply in your garage? What will the piping configuration be? Will all the equipment get equal power? Should you use a loop formation? Do you need a new system regulator? Which material should you go for? What is the quality of the air and do you need condensate removal? When it comes to piping for compressed air, there are a lot of options in the market. You can choose from black iron or galvanized pipes, PVC, stainless steel, copper or PEX which is cross-linked polyethylene. If you are looking for pipes for air compression for your garage, getting PEX is an optimum choice. This is because it is very flexible and lightweight. The fittings are very easy to set up so even a non-professional can do it. It is the simplest to install. It is very easy to reconfigure. This makes it a DIY guy’s dream pipe. Since PEX is very flexible, you can set it up where you normally wouldn’t be able to set up harder material pipes. For example, PEX is perfect for the finished walls or the ceiling of your garage. Another advantage of PEX over stainless steel and copper is that it is cheaper and less expensive to install. Not only do you save money when you buy the PEX pipes, since you can install it on your own, you save money from paying a professional to install it. You need to decide on the design and the set up for your pipes beforehand as when you use PEX, you will need special fittings. That is why it is best to first decide on your design and then go ahead with buying the pipe. PEX pipe is best bought online as then you don’t have to worry about availability at your home center or at the hardware store near you. You can also choose packaged kits. If you want a quiet yet powerful air compressor for your garage, then go for the Makita MAC2400. It has a 4-pole 2.5 HP motor so you get a lot of power. You get compression at 90 PSI at 4.2 CFM. This allows you to use the air compressor for a wide variety of tools in your garage. The Makita MAC2400 has twin-stacked 4.2-gallon tanks. Even if the floor of your garage is uneven, you don’t have to worry as the air compressor is very stable. You won’t get an air compressor which is completely silent. However when you compare it to other air compressors which have the same power, the Makita MAC2400 emits much less sound. 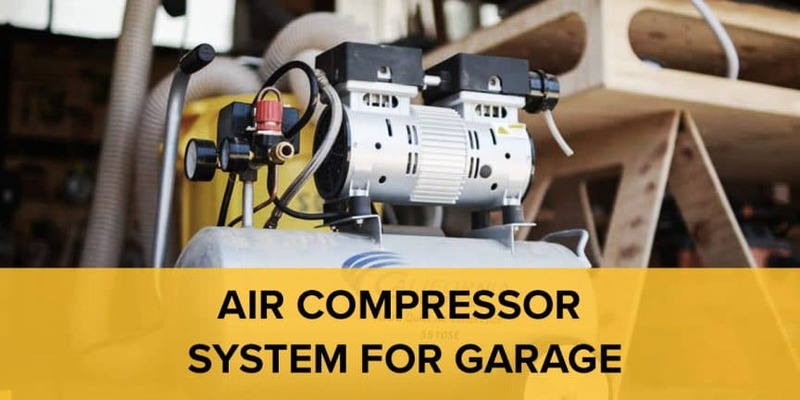 You can even have a conversation or listen to music in your garage when the compressor is on. One of the best and most powerful portable air compressors in the market is the C2002 from Porter-Cable. It is lightweight, easy to use, durable and extremely powerful. The air compressor has a six-gallon tank which is rather small but with 150 PSI maximum pressure output it is a very powerful one-tank air compressor. It has a 3.7 cfm flow rate so the air compressor can turn over quickly so you can work without interruption. This air compressor is mainly for small air tools which makes it perfect for your garage. Another advantage of the Porter Cable C2002 air compressor is that it will start even when the temperature is very low. Even though it is a portable air compressor, you will need to use its wheels to move it around as it weighs 30 pounds. If you are looking for an air compressor that is stationary, very quiet, and is a good value for money, then the California Air Tools 10020CAD-22060 Air Compressor is an excellent choice. The air compressor makes only up to 70 decibels of sound. It has a very powerful 2 HP motor. The motor operates at 1680 RPM so there is less wear to the motor and less noise is produced. This ensures that the air compressor is durable and can run for a long period of time. The air compressor is oil-free and gives you excellent performance. Where other compressors have a life cycle of 500 hours, this compressor can easily give you a life cycle of over 3,000 hours. So in addition to being able to buy it at a reasonable price, you also get a long lasting compressor which makes it an excellent value for the money. Hopefully this article has helped you learn more about the options for an air compressor system for garage! As always, if you have done anything like this in your garage, we’d love to know! Leave a comment below.